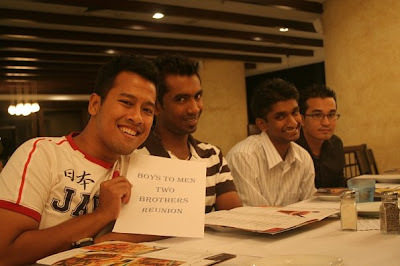 The boys of B.Ed.TESL Cohort 2 have found a connection, made a commitment & created a Facebook group! We were together since we were teenage boys. We saw each other grow into men. And we have become closer than brothers! Our private group on Facebook is appropriately named "From Boys to Men to Brothers"! 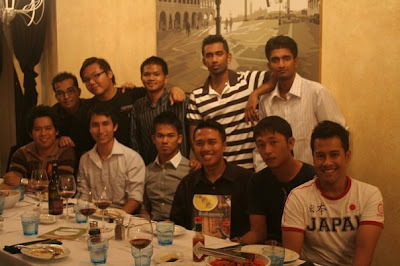 Last Sunday, we had dinner at the lovely Italiannies @ Gardens Midvalley. This restaurant is perfect for group dinning. The food comes in big portions ready to be shared with everyone sitting at the table. The waiters & maître d' are also well trained & very professional. Prices are very reasonable too. 6 group dishes fully fed 12 ppl for around RM30 each. Upon request, they wonderfully labelled our table. Although they made a mistake, it was still a huge honour to have the best table in the restaurant & have it exclusively labelled for us. A few of our brothers could not make it that day. Still I am glad that many made sacrifices to be there that day. Nasrul rushed all the way from Johore. Guna disobeyed his mom. Hilmi picked up Hadi (the f*cker) all the way from Putrajaya. Mien was there though he was sick. Hadi ditched his family. Khairil ditched a date. Nesa ditched his girl. Seng Chee ditched his PS3. Star ditched his sleep. It was rejuvenating to see & catch up with all of you again! We shall do another dinner next year! See you guys at other B2M2B events in between!